The way I can describe this pork ribs adobo sa gata is the usual pork adobo cooked in vinegar, soy sauce, aromatics, spices and added with coconut milk. It is a pork adobo with a twist. If I’m not mistaken, this regional version of the pork adobo originates from Bicol or somewhere in the Visayas where there are plentiful of dishes cooked in coconut milk and coconuts abound. 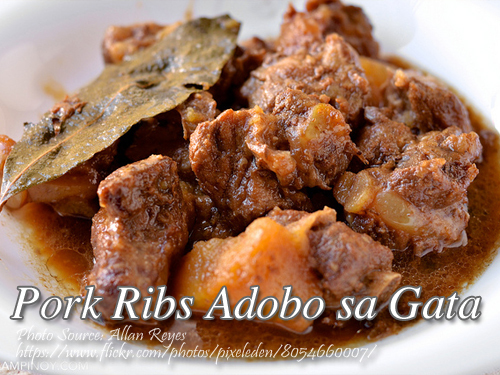 If you know how to cook adobo, I’m sure cooking adobo sa gata is a breeze. The way I can describe this pork ribs adobo sa gata is the usual pork adobo cooked in vinegar, soy sauce, aromatics, spices and added with coconut milk. It is a pork adobo with a twist. In a medium size pan, saute garlic, ginger and bay leaves until fragrant. Add in pork ribs and brown the meat on the bottom sides for about 5 minutes. Cover. Then do the same thing on the other side of the meat for 5 minutes. Then add 2 cups of water, soy sauce, vinegar, black pepper, onion, chilies and bring to a boil. Simmer until the meat is almost tender. Then add the coconut milk and simmer for another 10 minutes until the meat is completely cooked and the sauce is thickened. Season with salt or granulated seasoning if you want. Serve hot with steamed rice. I’m always planning to cook this adobo sa gata but I always forget it. I hope this time I can cook this dish. Thanks for your recipe! HI Jessica, just bookmark this page or write it in a memo pad. Good luck in your cooking!